We are back with some All Japan Pro Wrestling coverage again! 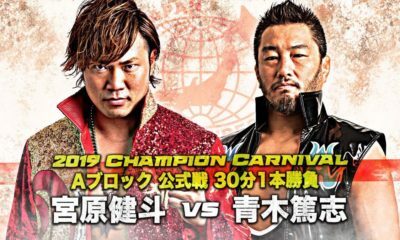 Finally, we get the much anticipated rematch with our Champions Carnival winner, Naomichi Marufuji taking on the current Triple Crown Champion, Kento Miyahara. 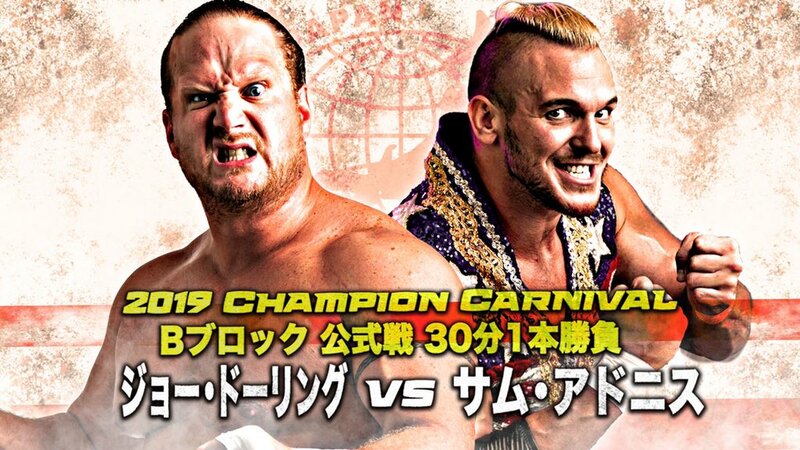 The last time these two fought was at the Carnival final where they both won their respected blocks and Marufuji would come out the winner to get a future title match despite him saying he had no desire to go for the belt at this time. However, they still gotta follow rules and keep the ball rolling, so here we are now. We got what looks to be a stacked show tonight and even the return of Jake Lee, something to look forward to. So let’s not waste anymore time and just…dive right in. 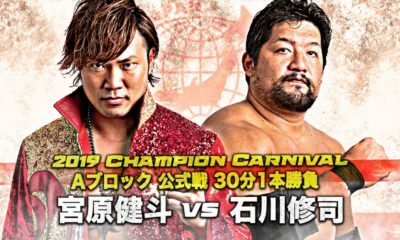 Review: Before the majority of the show gets covered in tag matches, we get a singles matches to kick the show off between Yohei and Ishikiri. I see Ishikiri wearing the Mortal Kombat logo on the side of his pants there, thumbs up to you. The match started really fast paced and fairly impressive might I add. Both of these men have done well for the opening bout and was mostly impressed with Ishikiri as he stood out for me a little bit more than Yohei, which I’m not saying he’s bad either. Around six minutes, Yohei would hit a spinning back kick which he calls Tobiushiro-Mawashigiri and then get the win in a pretty solid opener. Recommended: Good match to get the crowd going. 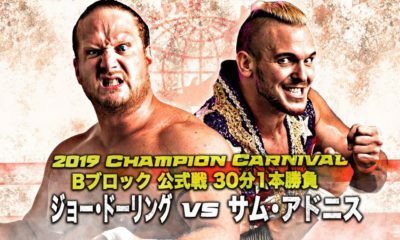 Review: This tag match is special to them since this is also a tribute match to one of All Japan’s greats, Jumbo Tsuruta who has passed away eighteen years ago this month. So this match between the people that remember this legend is for the respect they had for him and how much he meant to these four men right here. I think it’s amazing that the crowd reaction whenever Fuchi is in the ring is one of the loudest in the company right now next to guys like Kento, Suwama, Shuji, etc. Whenever Jun would hit Fuchi with an open fist or move out of the way when he goes for a dropkick, the crowd showers Jun in a ton of boo’s an it’s just entertaining and a bit heartwarming to see that they still love Fuchi. The match wasn’t great, but it was exactly how I expected it to go with four vets working together to give people still something entertaining at least and it was all in good fun, so what more could you ask for? Jun would do the Wrist Clutch Small Package Hold on Fuchi to get the win for his team. After the match, all four of them would honor the passing of Jumbo Tsuruta who is considered one of the greatest of all time and just the great in All Japan by many people, his spirit lives on with the company to to help shine All Japan to a brighter future. JUM-BO! Recommended: Fun match, touching tribute, and a nice call back to the stuff that happened during Jumbo’s era. Worth a watch. Review: Up next is a eight man tag with both teams consisting of two heavyweights and two junior heavyweights with Violent Giants teaming up with Sato and current Junior Heavyweight Champion, Atsushi Aoki taking on Zues minus Bodyguard who is resting his legs finally, teaming up with Joe Doering, Atsushi Maruyama, and Black Tiger VII. Last time the two Atsushi’s were in the ring, it was for the Junior Heavyweight Championship on the May 12th show where Aoki would retain over Maruyama, but it looks like they could go again if this match goes well. I just need to get this out of the way, but how is Zeus not won the Triple Crown Championship by now? I mean it because this guy is amazing and has a great fan following, I’m just surprised he hasn’t won their main title just yet, but I hope he does soon because I think he would be a fantastic champion if given the opportunity. Also another thing I want to point out and I feel like that it should be addressed here since it involves the junior division, and all I gotta ask is who is their leader? I ask this because the junior division is severely lacking leadership and while Aoki is probably the better one there so far, there’s still not enough that really stand out fully. When you look at WWE, NJPW, Impact, or Dragon Gate, you can see they have enough people to carry their respective division with a solid roster and giving us quality of matches, while All Japan really doesn’t and as Andrew said when we were special guests on Dave’s podcast called Uncle Jun’s Junction, there’s no spice there and when you had to rely on guys like TAJIRI and Ultimo Dragon to help carry that title and division (no disrespect to both men), then you need to rebuild it and soon. Anyway, onto the match before I ramble on about their weak division and how Zeus isn’t champion, this is probably my favorite tag match on this show since all eight of these guys showcased their stuff wonderfully here with great action between whoever was fighting who in the ring, even Joe did pretty well for himself there despite my previous complaints while still liking him at the same time. Think my favorite part was the abuse Maruyama took from Suwama when they shared the ring together and Suwama would hit him with a stiff Lariat every time, it just made me chuckle.The Violent Giants picked up the win with their Last Mountain (Double Powerbomb) on Maruyama. Recommended: Very good tag match, definitely worth viewing. Review: I must’ve read something wrong because I could’ve sworn we were supposed to have a Tag Team Championship match between TAJIRI and KAI taking on Dylan and Ryoji on this show, but I guess I’ve heard wrong or they changed it since we’re getting a six man tag instead while the title match will take place on the June 3rd show. I will admit that the team of TAJIRI and KAI is actually going pretty well as they have a good chemistry between humor and actual tag team wrestling, and it somehow works while on paper you would think it shouldn’t, but for some odd reason it’s working and you can’t explain it. Sato and Suzuki started off the match with some fast paced action and they were very crisp with their time together which made me wanna possibly see them in the junior hunt since these two were awesome. My one problem with the match was both teams of KAI/TAJIRI and Sai/Dylan were mostly doing their stuff outside of the ring and the fact they were away from each other, the camera had to go back and forth, and while I don’t mind stuff like it, but it did feel like it dragged on a little bit and they even did it for a brief moment a couple of minutes after that while Sato and Suzuki were just staying in their corners while these four kill each other. When everyone is finally back in the ring, TAJIRI would spray his poison mist on Sai to get him out of the ring while Kai took care of Dylan, and Sato picked up the win for his team with the Blue Destiny on Suzuki. TAJIRI and KAI now get more momentum leading in their upcoming title match and we will see if it pays off. Recommended: Not bad. Enjoy the flow of the show. Review: After being sidelined for ten months, Jake Lee makes his return to the ring as he teams up with Koji to take on his former partner, Naoya and Yoshitatsu, so let’s see if Lee has any ring rust from the time being spent away from the ring. Jake Lee didn’t do too bad for his first time back since there were times he felt like he was a bit out of it, but he did pretty well for the other times and not gonna harp on him since he just got back from injury. I know I said in the Carnival that Naoya could be one of the bright future of the company and I also mean that with Jake Lee since he also has that untapped potential and I saw that when he fought Shuji last year for the Triple Crown Championship. these two can definitely become great in the upcoming years. The match was solid for what it was despite some sloppy moments and a botched Tornado DDT by Yoshi, but also didn’t do bad despite that, and of course Lee won in his return match with hitting a vicious High Angle Backdrop on Nomura. Welcome back, Jake Lee. Recommended: Decent match, Jake Lee is definitely something special. 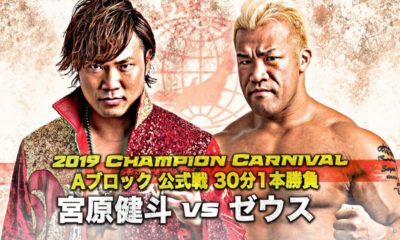 Review: Now it is time for the main event as Kento defends his Triple Crown Championship against the winner of this years Champion Carnival, NOAH’s Naomichi Marufuji. 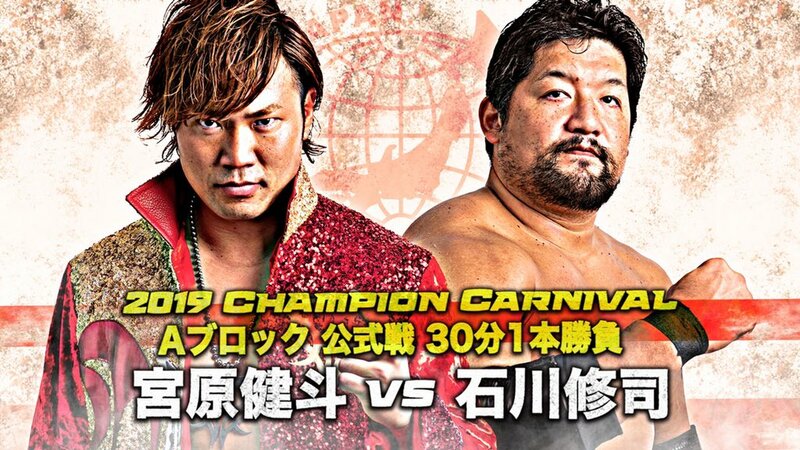 I feel like this is more of a continuation of the story between AJPW and NOAH as NOAH is already 2-0 when Marufuji defeated both the president of AJPW, Jun Akiyama and the current champion, Kento Miyahara. 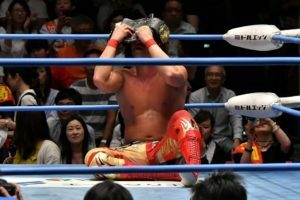 The history and story between these two companies is long and historic despite some of the bad blood they had over the years and I’m glad that they’re using this to help rebuild that bridge to have at least some type of closure, and also Marufuji looking to take their championship as an extra added aalt on the wounds he left there and bring it to NOAH before his GHC Heavyweight Championship match on the 29th of this month against Takashi Sugiura. Kento however is looking to avenge not only his loss to Marufuji (Which is a fantastic match and you should definitely check it out), but to avenge his companies honor since he felt like Marufuji disrespected it. So can lightning strike twice or will Kento get his revenge on Marufuji? Let’s not waste any time and see. I’m gonna get my one complaint out of the way here so it doesn’t take away from the rest of the match and what I’m about to say, and it’s that most of the felt very similar to their previous match and I mostly mean it with the opening sequence since aside from Kento being more aggressive, I felt like I saw it before and around the same time too instead of giving us a little bit something different to make it a completely new match and to me personally it did hurt it a little, but the match is still fantastic despite the one complaint. Kento showed more of his aggressiveness in the match here since he knew he had to win here or else All Japan would look like a joke compared to NOAH and Marufuji, and even Marufuji wasn’t giving him any mercy whatsoever during this match since he felt more aggressive as well and it was a much needed element to the both of them. Another thing I can say about this match is that it felt bigger and in a way it was since there was a bigger prize involved and the crowd was much more into this one, even gave it a New Japan type atmosphere with how the crowd was reaction to everything they would do and even with just chanting their name, and it was awesome. I felt like they hit the nail with everything they needed to do with progressing the story and adding another chapter with this rivalry, and the final five to ten minutes were tremendous and it was exactly how it should end with high impact and pretty much last resort to try and give it your all to win. Kento would finally hit the Shutdown German Suplex Hold and he avenged his loss while also retaining the title, and defending All Japan’s honor. 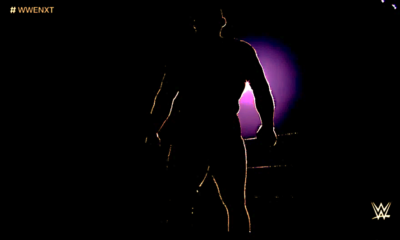 After the match, we have a new challenger into the mix and for some reason it’s….Dylan James. Why is it him again? What did he do to earn a title opportunity since his team lost earlier? Why are we awarding Dylan a Triple Crown match after having a weaker performance than Bodyguard in the Carnival? Did they just wanna give Kento an easy defense before the next big show? I got no faith in this match, but Jun apparently does, so we’ll see what happens. Now that Kento and Marufuji have one win against each other, when should they fight again? 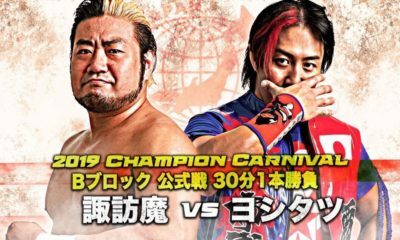 In the Carnival final, Marufuji did invite Kento to come down to NOAH sometime to perform and his 20th anniversary show is coming up in September, so I think we could have the final match of the trilogy there if they choose to go forward with it. It could even be a champion vs. champion bout if Kento keeps the belt til then and if Marufuji defeats Sugiura on the 29th to take his belt and keep it til then. Either way, I’m excited to see what they do with this next since you can tell it’s not over. Recommended: I liked their first encounter a little bit better by a hair, but still an amazing match and should be viewed a bunch of times. 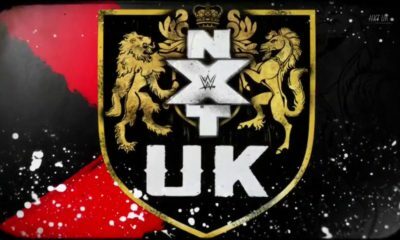 Overall: I thought the show was very enjoyable as none of the matches were bad at all and basically solid all around with a great main event to close it off. Looking forward to see what new chapters come their way except for Dylan/Kento. Least Favorite Match: Yohei Nakajima vs. Ishikiri (Not a bad match, but if I had to pick one. “Hey! It’s like this now!” Naomichi Marufuji and Takashi Sugiura, the story behind the championship match of 2018.